Are the Orfalea Foundation and Orfalea Fund the same thing? The Orfalea Fund was created by the Orfalea family in 2003 and sunsets at the end of 2015. The Orfalea Foundation has been the administrative entity managing the work of both The Orfalea Fund and the Orfalea Family Foundation. Where can I send my grant proposal? At this time, the new foundations are in the process of crafting mission statements and new objectives for our ongoing philanthropy. As a result, we are not accepting new grant proposals. How do I submit my grant evaluation? In October of 2015, all active grantees will receive information on how to submit final evaluations. How do I reach former coworkers of the Orfalea Foundation? Our very qualified team remains active in the Santa Barbara and philanthropic communities. We encourage you to contact them directly via Linked In. How do I get approval to reference the Orfalea Foundation in an article I'm writing? If you received a grant and wish to reference the foundation, please cite the entity designated in your original grant award letter and grant agreement. For other purposes, such as citing the Orfalea Foundation in an article or press release, permission must be obtained by writing to: info@orfalea.org. What happened to the REACH program? The REACH program will conclude its final years of programming under the leadership of the Wilderness Youth Project. How much did you give away and what was your average grant? Giving of the Orfalea Family Foundation and Orfalea Fund totaled more than $175,000,000. Our grants averaged $64,500, including three legacy gifts of $8M – $15M. Where can I find historical information about the foundation's other programs and projects? We have archived the Orfalea Foundation website (2012-2015) HERE. Philanthropy is giving back, but it is also an investment. And we get a marvelous return on our investments, in the form of a stronger, more resilient community populated by confident, creative contributors. We support programs that empower individuals so they are ready, willing, and able to make the world more just, more humane, and more prosperous." 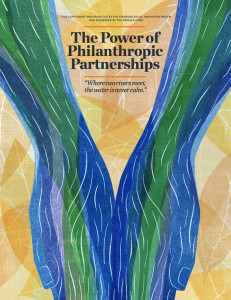 Partnership was essential to the work of the Orfalea Fund, and we collaborated with Stanford Social Innovation Review to share insights about philanthropic partnership in a supplement to their Fall 2015 issue, available HERE. The Orfalea Family Foundation, the Orfalea Fund, and the Orfalea family thank you for your partnership and support over the years. Coincident with the planned sunset of The Orfalea Fund, the Founders have dissolved the Orfalea Family Foundation to pursue their individual interests in philanthropy. We are proud of the foundations’ coworkers and their accomplishments over the past 15 years, and will remain active and committed to the Santa Barbara community. The Natalie Orfalea Foundation is in its formative stages and is not accepting proposals during this time of assessment.